When Jordi first read the AVID position description last October for a volunteer water engineer to work in Bhutan, the only reason I’d even heard of this country was that it measures Gross National Happiness (GNH) instead of GDP as a measure of progress. It had been mentioned in my Masters course on Environmental Management the previous trimester. In truth, we still had to look up on a map where exactly Bhutan was! But we soon discovered that hardly any of our family or friends had heard of this little Himalayan kingdom we’re currently enjoying the privilege of living in for 12 months. 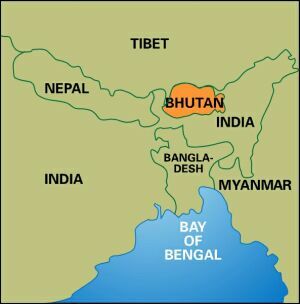 The common response was either “Where is that?”, or if we were lucky, “Oh, that’s the country that measures Happiness right?” But perhaps we shouldn’t feel too bad as even the Prime Minister of India, Bhutan’s largest neighbour to the South, appeared to be a bit confused about where he was on his visit here last month. It was his first foreign visit since assuming office as India’s new Prime Minister and in his address to the Bhutanese Parliament, it became apparent that Narendra Modi thought he was in Nepal or Ladakh (a state of India)! Oops! But Bhutan’s reputation for this so called Gross National Happiness (GNH) is putting the country on the map. The Index has been attracting increasing attention from around the world in recent years, partly because the United Nations specifically requested Bhutan to develop the GNH philosophy further and prepare a submission to the UN’s “post 2015 development agenda” (2015 being the deadline that was set for achieving the Millennium Development Goals). 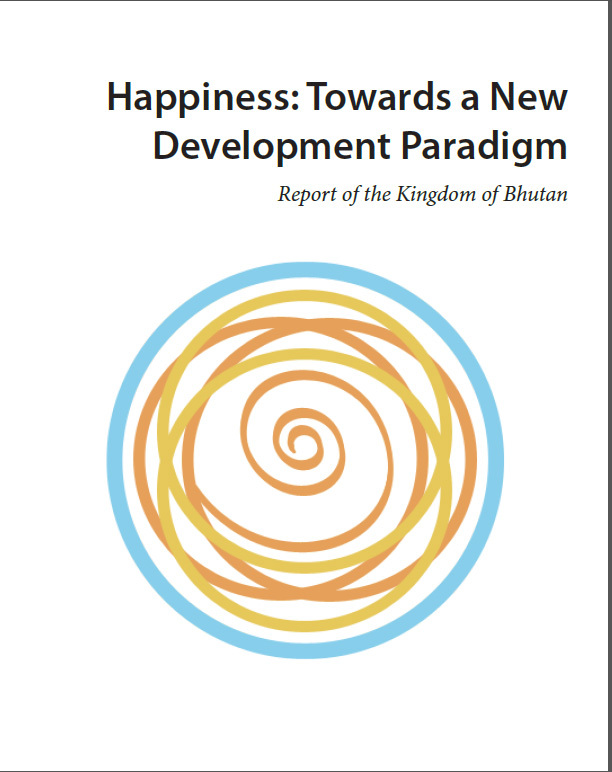 Bhutan’s report, entitled “Happiness: Towards a New Development Paradigm”, was completed and submitted to the UN General Assembly in December last year. Further, GNH is attracting visitors to Bhutan to learn more about it. Last month I was fortunate enough through my association with the GNH Centre to attend the first day of a week long course on GNH. Of the 9 international participants, 6 were from Australia and from a range of different backgrounds (lawyers, health practitioners, teachers etc). 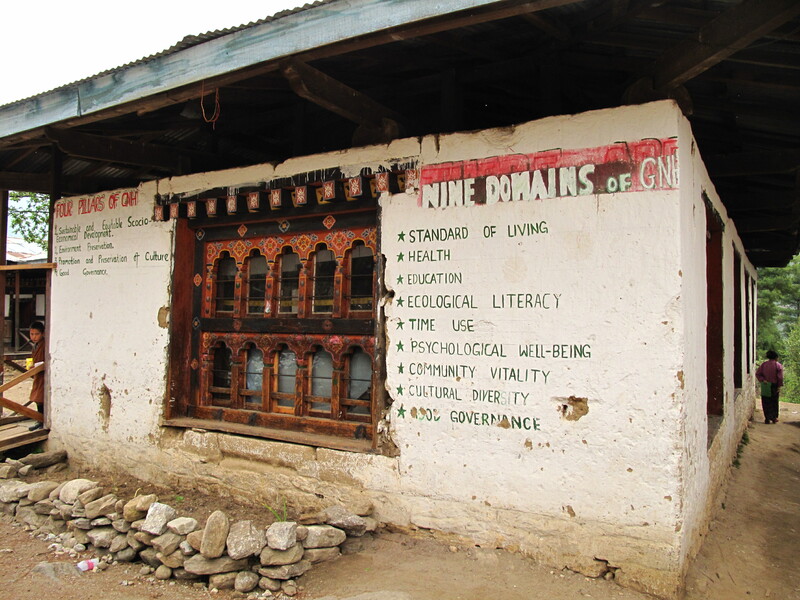 The Centre runs a few courses a year for people from Bhutan and all over the world to come and learn about GNH. The title of this course was “GNH and the inner dimensions of social transformation”, focusing on the individual and the notion that if we want to change the system, we have to change ourselves. But what is Gross National Happiness (GNH)? How is it measured? And is it a good measure of progress? The term GNH was coined by the 4th King of Bhutan, King Jigme Singye Wangchuck in 1972 when he declared that GNH is more important than GNP. He was essentially verbalising something that was already part of Bhutanese culture through the country’s Buddhist spiritual values. It has been a guiding philosophy of Bhutan’s development ever since in its desire to modernise sustainably – what they’ve termed “the middle path”. It has been noted, however, that the concept goes even further back than this to Bhutan’s legal code during the unification of Bhutan in 1729 which states “if the Government cannot create happiness for its people, there is no purpose for the Government to exist”. It is important to note that the definition of happiness in GNH is not our western hedonistic understanding of happiness, a fleeting, pleasurable ‘feel good’ mood, but rather the feeling that comes from living in harmony with nature and serving others. It is being happy with what you have, rather than seeking happiness from what you lack. Like the definition of “sustainability” though, GNH has come to mean different things to different people. It has evolved and one could argue it’s been corrupted: been taken out of context, attached to many things and diluted. But essentially GNH means development with values. A common misconception of Bhutan by outsiders or first time visitors then, is that because Bhutan measures its progress via GNH rather than GNP, everyone must be happy! And one can be forgiven for thinking this as Bhutan is often labelled as “the happiest kingdom on earth” or “the last Shangri La”. However, as the previous Prime Minister of Bhutan clarified in his address to the UN: “Bhutan is not a country that has attained GNH … like most developing nations, [it is] struggling with the challenge of fulfilling the basic needs of [its] people” . In fact, the results of the 2010 GNH survey indicated that 60% of respondents are “unhappy” or “narrowly happy” (as opposed to the other 40% who were either “extensively happy” or “deeply happy”). Happiness is rather a goal the country strives for i.e. that development is for the wellbeing of all creatures. Each domain has 2 to 4 indicators making a total of 33 indicators across a diverse range of conditions considered important for happiness. 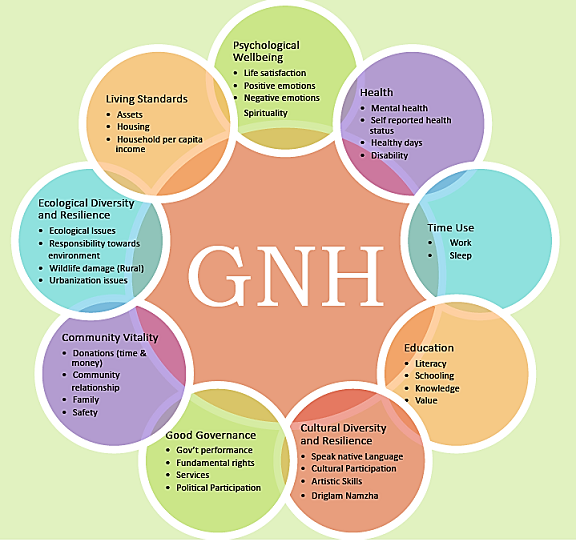 GHN is measured via periodic representative surveys of the population (1% of the population with respondents from all 20 districts). The first pilot was conducted in 2006 followed by national surveys in 2008 and 2010 and based on this the index was developed. The surveys contain 72 questions that measure the extent to which people achieve sufficiency in each of the 33 indicators. This data is analysed to determine where unhappiness is arising from and for whom e.g. for people in rural Bhutan it tends to be those who attain less in education, living standards and balanced use of time. For those in urban Bhutan it tends to be those who are lacking in community vitality, culture and psychological wellbeing. New policies and programs can then focus on creating the circumstances most conducive to happiness. A Policy Screening Tool was developed on this basis. All new government policies and programmes are screened by the GNH Commission before they are enacted. Any proposal that fails is returned to the relevant agency for amendment. GNH of course has its fans as well as its critics. One of the noted strengths of GNH is that rather than development which allows the rich to get richer and the poor to get poorer, GNH is considered responsible for the equitable distribution of development to date (albeit still at a low level). On the other hand, many have been critical of the subjectivity of the tool and its practical implementation. A vocal critic of GNH is Dr. David Luechauer and his criticisms are detailed in a 3 part interview series in one of Bhutan’s national newspapers, The Bhutanese. A key point that came out of the discussions with my colleagues online this week, as we discussed the relative merits of GNH as a tool for the assessment of sustainability and ecosystem health, was that its main strength was also one of its weaknesses. That is, while it captures qualitative data that many other indicators don’t, being survey based it relies on people’s perceptions of ecosystem health rather than hard scientific data about air quality, water quality etc. This has been acknowledged in Bhutan’s submission to the UN suggesting an improvement of the index in the future would be that it include both qualitative and quantitative analysis. To be fair however, it is still relatively early days given that the index itself is less than 8 years old. The creators acknowledge it is a work-in-progress and will be adapted and refined over time. The survey was designed to be repeated every 2 years, but unfortunately there hasn’t been another survey since 2010. The current Prime Minister of Bhutan, who came into office last year in Bhutan’s 2nd ever national democratic elections is not as strong an advocate of GNH as his predecessor. In fact some say he’s actually quite dismissive of it. Nevertheless, what this tiny nation has been able to achieve by making a concerted effort to stop and think about how they want to develop, in the face of globalisation and the dominant economic paradigm, is truly inspiring. It will be interesting to see if and how it will influence the UN’s post 2015 Development Agenda. A US based Non-profit organisation “The Happiness Alliance” has produced an online survey adapted from Bhutan’s GNH Index which you can complete (takes about 15mins) as a self-assessment to see how you’re tracking in terms of your own happiness and wellbeing. This Post was tagged 9 Domains of GNH, Bhutan, GNH, GNH Centre, GNH Commission, GNH Index, GNH Indicator, GNH Survey, Gross National Happiness, Post 2015 Development Agenda, Sustainability Indicator, sustainable development, the happiest kingdom on earth, the last Shangri La, the middle path, UN, UN General Assembly, United Nations. Bookmark the permalink. most instructive, thank you Jen.